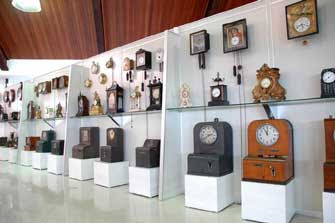 Keeping discovering the curiosities and rarities Sao Paulo can offer, we suggest today the Museum of Clocks. It's hosted in a factory in Vila Leopoldina, the museum has about 600 clocks and watches from the huge models to tiny pulse watches. It worth a visit to observe the details of each piece and its peculiarities. Some models are very curious and others, very old, dating from the seventeenth century. There is a coffee maker clock, totally mechanical and invented at the beginning of the twentieth century, which used to wake up the owner and make the coffee. The alarm rings and the coffee is ready, you can find out how it worked at the Museum. The first watches were purchased in 1950, but the Museum was only founded in 1975. It brings together all the private collection of the owner of the company, Professor Dimas de Melo Pimenta. The older model is a German one of 1620. It only shows the hour, since at that time the engines were not able to show the minutos. At the entrance of the building there is a huge clock with more than seven meters of diameter. Among the highlights, French clocks made of porcelain, including one that get recharged with sunlight and another when placed in water. There is a melted clock, as in the work "The Persistence of Memory", by Salvador Dalí. Do not miss the turtle-clock of 1921: a turtle moves in the water indicating the hours. For free this week - November 23-29! Premio Paladar 2009, don't miss it! 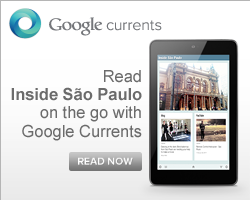 Sampa Hostel, sleep and pub crawl in Sao Paulo! Casa Club Hostel Bar, a great place to stay!